SourceTV Exclusive: Consequence Honored For Co-Writing Beyonce's "Party"
There are a lot of sneakerheads out there who frown upon a pair of customs, no matter how nice they may appear to be. Worried about their shoes being thought of as fake, many will take a look at what may be the dopest pair of custom kicks & keep scrolling. We here at The Source, however, give recognition to those who are worthy of it, & judging by the looks of his latest Air Jordan customs, Mache‘s time is now. Mache Custom Kicks has been around for longer than a little while, but it’s his latest pair of sneakers that have garnered tons of attention. Everyone reading this knows (or should know) that one of the most popular Air Jordans are the 5’s, so any custom done on this specific pair better be good. 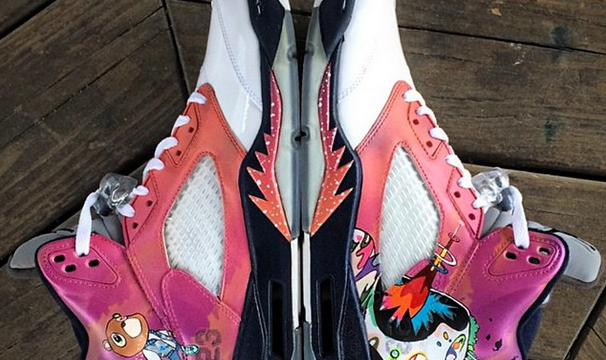 Using the White/Midnight Navy- Varsity Red Air Jordan 5, he replaced the shoe’s details with Kanye West‘s Graduation album cover, which is arguably one of the best albums the entertainer has ever put out. With the gradual fade from pink to purple on the midfoot and heel & the “Dropout Bear” & album cover graphics, this is definitely a pair of customs fans of both Yeezy & Jordan would like to see hit the shelves. 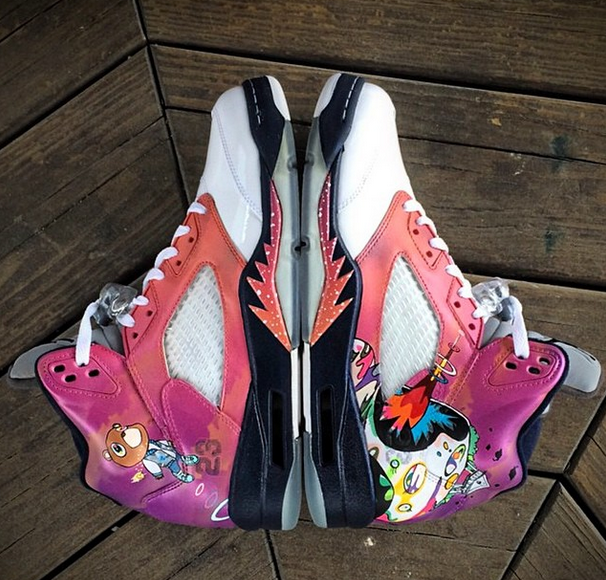 Take a look at more of his customs here. K(icks).R.E..A.M.- Kairi C. Follow her on Twitter @_findingforever.